It's about time I wrote a post on this, before the year ends. This really is a long overdue review and it's also something symbolic for me. Wipe it all away and start with a clean slate for the new year. This is the last of the KOH products in my stash that was sent to me by KOH a few months ago to review. Wipe It Away was actually released early this year. The premise of KOH Wipe It Away is that it's a handy, very portable nail polish remover that you can conveniently (and stylishly) carry around in your bag. It's not the kind of nail polish remover that we are accustomed to as this one is super concentrated and as you would have noticed, it's in a conventional nail polish bottle with a nail polish brush. This innovative and revolutionary nail polish remover without acetone removes all coloured polishes very fast and easy. Because of the special combination of this instant nail polish remover with Vitamin E and Castor Oil, the nails are cleaned and degreased mildly which also makes this extremely suitable for brittle and dry nails. Generously apply Wipe It Away with a brush to the entire (polished) nail and leave it to work for 8-10 seconds. Do not spread the layer like you do with a nail polish, but leave a thickish layer on the nail for the best results. Subsequently, rub your nail clean with a tissue or cotton pad, moving from the cuticle to the top of the nail. This prevents polish running underneath the cuticle. Wipe It Away does take some getting used to. I took these pictures a while back with KOH Neon Roze. That would be two coats of polish with a stamp design. This is how it works. Applied a thick coat of Wipe It Away on nail and waited about five seconds. Then in one movement, I used a cotton pad to rub the nail polish off. There is still nail polish remaining on the nail. Repeat with a second thick coat. Nail polish is substantially removed but the cuticle and sides of the nail could still do with some extra cleaning up. I experimented with different types of polishes. Averagely, I needed three to four coats of Wipe It Away per nail to get the nail totally clean. The number times would depend on (a) the number of coats of nail polish, (b) the type of nail polish used (glitter would of course take more coats and effort). The sides and the cuticles are the hardest to clean. 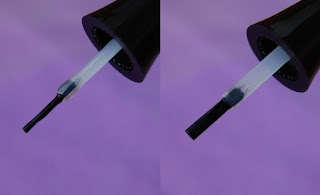 The brush does get to these parts, but it's the cotton pad that sometimes fails to reach them. 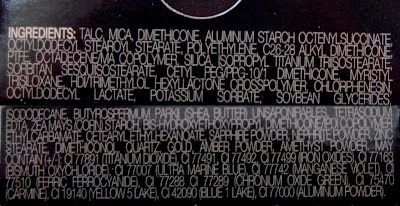 Because the formula is thick and highly concentrated, you can swipe only once with each coat of Wipe It Away. The cleaning should be done nail by nail. One musn't wait too long after applying Wipe It Away. Otherwise, it would dry on the nail, making it impossible to rub off. Apply Wipe It Away on one nail, then rub off. It won't work if you applied it on all nails and then tried to rub off. Wipe It Away would have dried by the time you got back to that first nail. I once tried applying it on the nail and left it to dry. What it ended up being was a top coat! Interesting. Nails seem less dry (but only marginally) after using Wipe It Away compared to conventional acetone-free nail polish remover. The liquid has a mild chemical smell but strangely, after rubbing it off the nails, the nails are left with a pleasant scent, quite like the scent of KOH Body Sensations products - a cherry blossom scent, I believe. Like all KOH nail polishes, Wipe It Away comes in a lipstick holder-like case. This is definitely a luxury product. Wipe It Away retails for €19.95 (10ml). 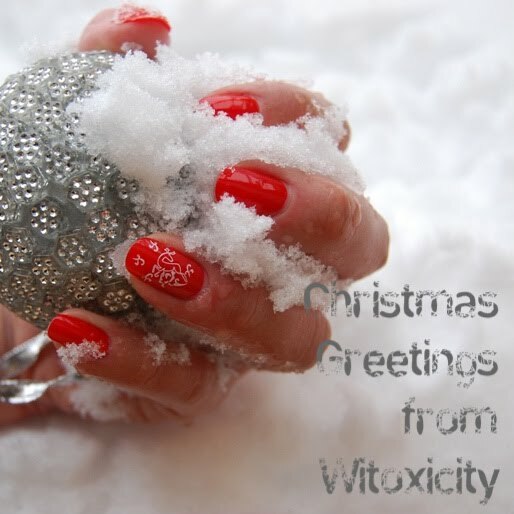 How do you like my very simple Christmas manicure? I don't know how to draw Santa freehand.......wait, let's rephrase that. I don't know how to draw. Period. Of all the stamping images I've got, this is the only one that comes close to looking Christmasy (it's from Chez Delaney's H28 plate). I'd like to think of it as a reindeer, a reindeer galloping somewhere in Lapland. It's tempting, but let's leave the nail polish for another day. Right now, I'd like to wish all my readers and friends peace and joy this Christmas. Have a blessed and Merry Christmas! Prettige Kerstdagen! I have a tendency to stick to safe eye looks – nothing too colourful, nothing too dramatic. The last time I did a look that was rather dramatic was back in July, a surreal month during which my father passed away. In fact, I had dedicated that eye look to him. To this day, I still wonder what he might have thought of it. This is my first experience with Light E304. From the press photos, I had expected the colour to be a pale lilac. In person, the colour looks a bit darker, more like a medium purple. It nevertheless looks lilac in these photos here because of its metallic finish. 1. Dabbed with finger the blue of Milky Eyes E203 on the entire lid except for the lid fold. Using the finger helps to fade out the edges. 2. The aim was to elongate the eye, so I pulled the blue out to way beyond the outer corner of the eye. I used an angled eyeliner brush to create a more defined outer edge of the blue. 3. Applied the medium purple of Light E304 directly on the lid fold using the pen’s brush. Due to the way my eyelid folds, I had to make sure not to go beyond the boundaries of the fold. Otherwise, it would have looked rather odd in my case. 4. Still using the pen’s brush, I coloured my lower lid with the metallic E304, extending the line to meet the blue. 5. Lined the upper and lower lash line with the blue of E203. 6. Curled lashes and applied three coats of Mascara E401. That's it, really. Just two liquid eyeshadows and a mascara. There is no blending, the two shades were deliberately left clearly defined. This look would not have been possible without the kind generosity of the folks at ELLIS FAAS who provided me with these pens. Ooh, I’m (un)fashionably late to the party, I know, but I finally got myself a holographic nail polish! For the life of me, I don’t know why it has taken me this long to try one. Here’s Britta, a very Scandinavian name from an equally Scandinavian brand. Make Up Store is a Swedish brand. It has stores all over the world, so chances are, you would have already come across this brand before. Britta applied fairly well, but I did notice, after two coats, some small bald-ish areas where the grains didn’t cover the nail sufficiently. As this is my first time with a holo, I wouldn’t know if it’s normal. Anyway, that issue wasn’t something that a third coat couldn’t fix. I applied two coats on all nails except for the ring finger here. That one has three. Britta is a pale pink with micro holographic shimmer. I think for those who are all too familiar with holos, you would be quite apathetic about this pink holo. As for me, I'm simply enraptured by Britta. It looks gritty on the nails but in fact, the finish is smooth. 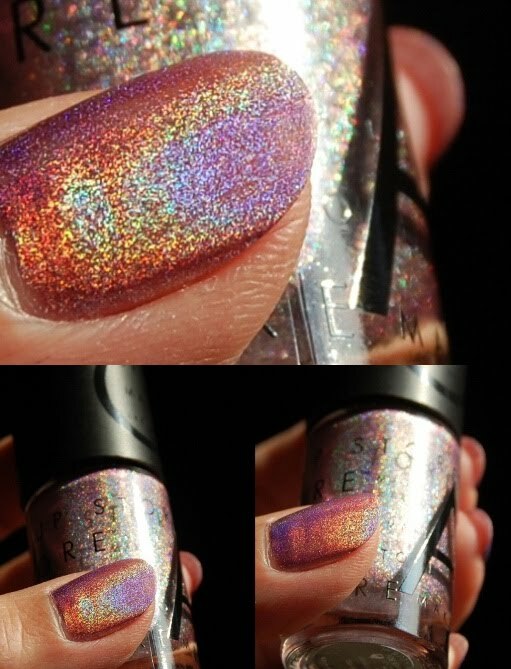 Holographic nail polishes tend to fascinate many of us because of the micro mirrors (or are they prisms?) that reflect light, thus giving the wonderful iridescent effect. It’s like having rainbows on your nails. True to tradition, just like so many ladies before me who have ever featured holographic nail polishes on their sites, I will now show polychromatic Britta from different angles. It looks plain without good lighting or when viewed from a disadvantageous angle – like metallic matte – so thank goodness I had rays of sunshine pouring through my window! The shape of the bottle does remind one of GOSH nail polish bottles. I did a quick comparison and found the one from Make Up Store to be a tad taller. Make Up Store nail polishes retail for €14.50 per bottle (8ml). I purchased Britta from its store in Amsterdam. Note: I’ve also updated my article, Beauty Shopping In The Netherlands: Branded Stores, to include Make Up Store in the list. More information: Make Up Store website. Meet Jade Delight and Jade Jewel. A pale chartreuse and a khaki green. 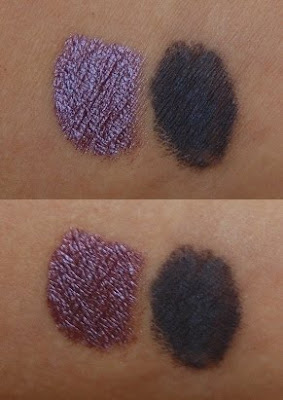 I acquired these Rituals Cosmetics single eye shadows at different times, which on hindsight, was not very smart of me. If I had known earlier that I was going to get both these colours, I would have gotten better value for money by purchasing the Duo Eye Shadow called Double Jade instead. Double Jade has the same two shades! The eyeshadows are housed in sturdy square black compacts. Each comes complete with a decent sponge-tip applicator and a mirror. The compact shuts with a magnet, a pretty strong magnet, in fact. 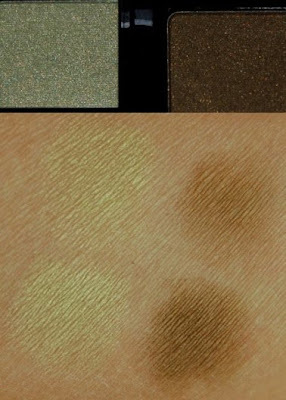 These are powder eyeshadows with bits of shimmer. They crumble only slightly. They apply well and I’ve experienced minimal fallout. As usual, an eyeshadow primer helps a great deal to intensify the colours. In this eye look, I used Too Faced Shadow Insurance. I really, really love this colour combination. Jade Delight, the pale chartreuse, looks goldish on the skin. Jade Jewel is something between khaki green and khaki brown. On the skin, the shade reminds me of antique brass. I had the perfect eyeliner shade to complement these two colours and that was Velvet Touch Eye Liner from GOSH in the shade Metallic Brass. I completed this look with GOSH Wonder Volume Mascara. 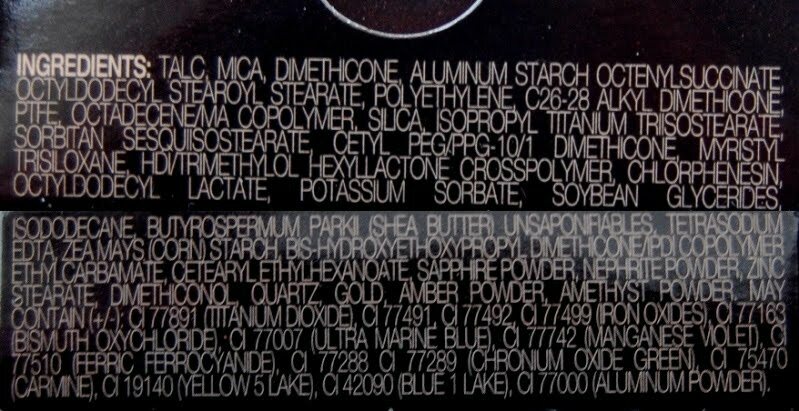 Rituals calls this gemstone makeup as these eyeshadows contain sapphire powder, amongst others (have a good look at the ingredients list above). Again, I refrain from saying anything further about that. Let's just enjoy the eyeshadows as they are. Win it! 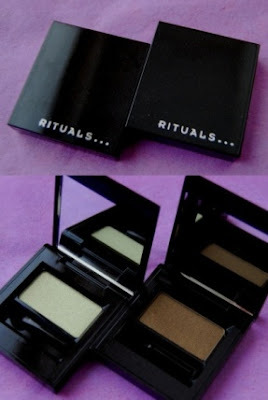 These two colours can be found in Double Jade, the duo eyeshadow featured in the Rituals Cosmetics Makeup Giveaway. It's on till 6th January 2011.